It hasn’t been an easy road for 3* LB Kameron Brown. For much of his recruitment, he’s dealt with rejection after rejection from FBS schools. “Too slow”, “not big enough”, “tweener” and plenty of other excuses were given on why he can’t play at the next level. 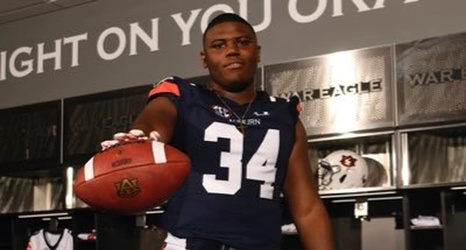 But in early January, Auburn decided to give one of the top tacklers in the state of Georgia a chance and offered Brown. Today, he made things official. It’s hard not to cheer for Brown. The younger brother of Auburn’s start defensive tackle Derrick Brown, he’s a kid who has constantly had to battle the fact that he doesn’t posses the same physical tools as his brother.